Join Piemonte’s Castello di Verduno at Perbacco for a special evening in the Perbacco dining room on March 16! As one of the busiest months for the wine world, March is filled with events that draw winemakers from all over the world to San Francisco. A Matter of Taste by Robert Parker, Slow Wine, Tre Bicchieri by Gambero Rosso, and Taste of Italy by James Suckling are the key events that bring the wine community together to showcase their hard work. 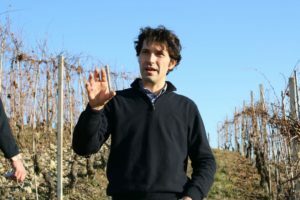 We are pleased to feature two upcoming wine events at Perbacco with Piemontese winemakers who are fortunately in town. On Friday, March 16 we are thrilled to have winemaker Mario Andrion of Castello di Verduno join us in the Perbacco dining room to share his incredible wines. Along with our complete dinner menu, Chef Staffan will create special dishes to pair with the wine for the evening. To make plans to join us, please call (415) 955-0663 or reserve online. We hope you’ll join us!